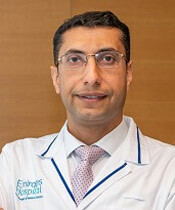 Dr. Mohamed completed his MBBCH in 2002 from Tanta University, Egypt. He followed it with MSc in Orthopaedic Surgery in 2008 Cairo University, Egypt. He has a vast experience in performing varieties of arthroscopic and minimally invasive surgeries in the field of orthopaedics including shoulder arthroscopy and knee arthroscopy as well as joint replacement surgeries for knee and hip joints. His skills and expertise includes dealing with all orthopaedic problems and trauma to upper and lower limbs, dealing with dislocation, fractures by closed and open reduction techniques, management of multiple trauma patients and open fractures according to ATLS guides and minor surgeries in the emergency O.R. like tendon repair and external fixation. He can also manage peripheral nerve entrapments, muscle and tendon problems and age related orthopaedic conditions such as osteoporosis, fragile bone fractures and osteoarthritis. He also takes special interest in sports related orthopaedic injuries.